In 2012, DARPA, Defense Advanced Research Projects Agency of the United States, demonstrated that fire can be put out by surrounding it with two large sound speakers. 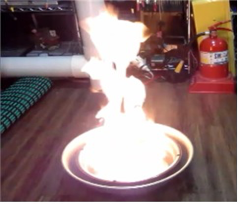 This verified the possibility of a fire extinguisher utilizing sound. Since then, many people have tried to develop a more efficient sound extinguisher, recognizing its future value. 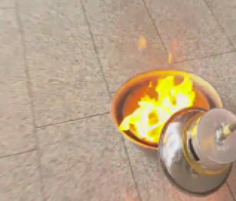 For example, in 2015 a couple of American graduate students introduced a portable sound extinguisher and demonstrated it on YouTube, but it was too heavy and too weak with long cables. The basic mechanism for a sound extinguisher can be summarized as follows: When the sound extinguisher produces low frequency sound of 100Hz, its vibration energy touches the flame, scatters its membrane, and then blocks the influx of oxygen, so the flame goes down. 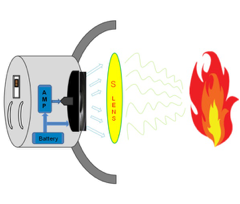 Recently, a research team of SSERI, the Sori Sound Engineering Research Institute, introduced an improved device, a “sound-wind extinguisher,” by installing a sound lens in a speaker to produce more focused power of sound, roughly 10 times stronger in its power than the previous one. This sound-wind extinguisher is very light, weighting only about 2 kg, 1/3 of the previous one, and can be carried around with one hand without any connecting cable. It is also small in size measuring 40cm in length. With an easy on-off switch, you can use it anywhere, up to 1~2m distance from the flame. The most important improvement to be found in our sound extinguisher from the previous one is the installation of a sound lens. If you use the sound in a usual way with a normal speaker, it scatters into the air without displaying any effect on the flame. On the other hand, when the sound lens is used with a speaker, the lens concentrates the sound generated from the speaker into one place and makes it possible to reach the fire more directly. In other words, it amplifies sound to maximize its efficiency without losing the power of sound which might be caused by the interference of the air. air. The team also succeeded in reducing the size and weight of the extinguisher, so that anyone can carry it anywhere at any time, improving its portability with an easy on-off switch. 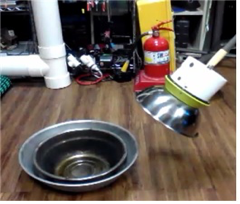 The experimental sound extinguisher is shown in the following pictures and video clip. The following figure illustrates how and where to install a sound lens inside of the sound extinguisher. We believe that the sound-wind extinguisher is fit best for the beginning stage of a fire. It can be used at home, at work, on board in aircrafts, vessels, and cars. Ahn, I.S., Bae, M.J. “On a Compact Extinguisher Using Sound Lens,” KICS, Proceedings of 2016 Conference of KICS, Vol. 32, No. 1, pp. 10C-13-1~2. Jan. 20-22, 2016. Lee, E.Y., Bae, M.J. “On a Focused Transducer for Fire-extinguishing,” ASK, Proceedings of 2015 Fall Conference of ASK, Vol. 34, No.2(s), pp. 35, No. 13, 2015. Park, S.Y., Yeo, K.S., Bae, M.J. “On a Detection of Optimal Frequency for Candle Fire-extinguishing,” ASK, Proceedings of 2015 Fall Conference of ASK, Vol. 34, No. 2(s), pp. 32, No. 13, 2015. Yeo, K.S., Park, S.Y., Bae, M.J. “On an Extinguisher with Sound and Wind,” ASK, Proceedings of 2015 KSCSPC, Vol. 32, No. 1, pp. 170-171, Aug. 14, 2015.